Who needs flowers on Valentine’s Day when you could get a box of chocolates. Which brand is your favorite? Hershey? Lindt? Godiva? Dove? They are all very different, but oh so similar. What makes them so similar you may ask? You guessed it, milk and lots and lots of artificial sugar. 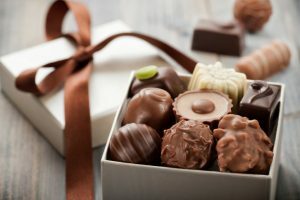 On Valentine’s Day, Thursday, February 14th, we are going to try pure, natural international chocolate. Thanks to our friends at Trader Joe’s, we will be sampling chocolates from Ghana, New Guinea, Tanzania, Peru, Ecuador, Venezuela and the Dominican Republic. No added sugars, cream or artificial flavors. You will not believe the difference. Some say bitter, others say raw, and some say yummy. If you are a chocolate lover, do not miss this class. Who knows, you may never go back to Snickers or Kit Kats ever again.